Richard Roberts sure loves his brother Jerry. Sadly, Jerry passed away in summer 2016. The only thing Richard loves more than the memory of his brother is the legacy Jerry left behind: a 38-foot-tall lighthouse in Richard’s backyard at 4334 N.E. Holman St.
Jerry, who suffered from alcoholism most of his life, moved in with Richard five years ago. Richard wanted his kitchen remodeled, and Jerry offered to construct it. Richard agreed – but only if Jerry stopped drinking. Jerry did. The job included rebuilding the cabinets and installing new tile. Jerry shared his basement apartment with his collection of about 100 mini lighthouses. He mused to Richard he would like to build one. A big one. A life-size one. Richard knew he could not say “no” to his brother. “If you want to build one, build one,” Richard told him. Jerry set about to build himself a lighthouse. There was an existing concrete slab in the backyard in the middle of tall waves of grass. That formed the perfect base. Jerry nailed together large 2-by-4-inch pieces of pressed wood, and painted them twice. It had to be perfect. He bought the best fitting windows from Goodwill. Once he completed construction, he added a turntable from a record player and placed large light bulbs on it facing outward. He nailed metal plates inside the top of the lighthouse so it would shine and lights would revolve out into the night. There are a series of ladders inside, along with a number of empty chairs. It resembles the bottom interior of a Disneyland space ship, large enough to throw a small cocktail party of five to six guests. 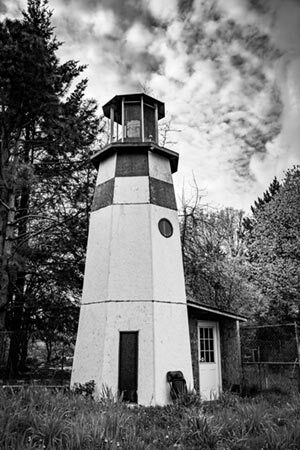 “If it floods again, we’re the only ones going to have a lighthouse,” Richard recalled Jerry telling him. “We need a ship,” Richard responded. Richard acknowledged that people think he is crazy. He has a lighthouse that is 100 miles from the ocean. Tamara is Edit Kitten, a writer with 20-plus years of experience offering a softer, gentler approach to editing and coaching. Her personal editors – Armani, Max Factor and Spicey’D – are also her cats. Visit her at EditKitten.com or contact her at Tamara@editkitten. com.